Detailed real estate exam tracking. 100% Pass Guarantee. We will extend your subscription until you pass! 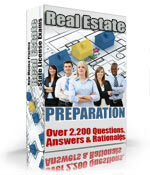 Instant online Access to over 2200 real estate exam questions, answers and rationales for 1 month. Choose your state below. Includes Exam Creation, Tracking and Review Features for One Month. Instant online Access to over 2200 real estate exam questions, answers and rationales for 3 months. Choose your state below. Includes Exam Creation, Tracking and Review Features for Three Months. This test preparation is for the National portion of the real estate test only. I understand that this test preparation is for the National portion of the real estate test only.